This product claims that it functions as a great moisturizing lotion and also works as a cure for the symptoms of eczema such as rashes, inflammation, and irritations associated with minor skin conditions. Supervision is recommended. Comes in a small box (4 oz.) and in addition to flower extracts and other natural ingredients, contains a bit of hydrocortisone which is actually a doctor recommended treatment in the leading prescription rash medications that has been shown to reduce redness and swelling related to rash in skin. There are many products just like this available on the market everywhere and it is a shame the way that these companies get away with making their products seem much better than they actually are. The bottle is so small at a measly 4 ounces, that there is no way you would ever want to use this as a lotion, or you would have to totally break the bank every time you needed to moisturize. In addition to that, there may be hydrocortisone, but it is such a small amount that I won’t really do anything. Yes it will relieve redness for a time, but it doesn’t do anything that other medications don’t do. The ingredient is basically only in there so that they can claim that a clinical treatment is in there and use this claim to bolster their reputation. The fact is this medication is weak and should not be used by sufferers of serious problems. I beg to differ. I’ve tried many types of eczema creams and lotions, as well as cortisone creams in general for my condition. This product works rather quickly to sooth my skin and heal WITHOUT it hurting to apply, or forming a film that makes scratching even more tempting than trying to suffer through the dry itchiness. Ever scratch off all of your lotion because it didn’t work to relieve your itchiness? I have. 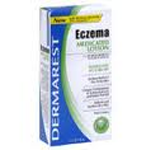 My ezcema reoccures every few months- and the Dermarest Ezcema Lotion, for a reasonable price, helps get me back into remission much more quickly and painlessly than many other products. I recommend this product as a sufferer of eczema. It is not a casual lotion, to rub all over, it is meant to be put directly on the scabby gross lichen-like hot spots of eczema. Use something else as a body lotion. Definitely if you find a good lotion to maintain your skin during its healthy periods- use that instead. Use this on your skin condition in order to feel 24 hours of relief. Put it on every night at the same time, and never wake up in the morning with your calves and inner elbows torn to shreds by night scratching. Instead of trying to apply a cortisone cream every eight hours and go through a tube a day- this will last up to a week or two, plenty of time for the hard part to be over.